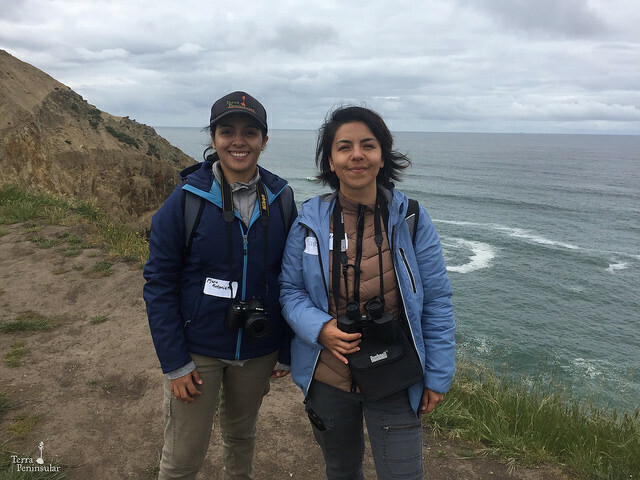 Ensenada, Mexico, May 15, 2018 (PRESS RELEASE).- From April 27 to 29 of this year, Claudia Guzmán, Community Engagement Coordinator, and Antonieta Valenzuela, Communications and Public Relations Coordinator, of Terra Peninsular attended the 9th Point Reyes Birding and Nature Festival in Point Reyes Station, California, this with the objective of strengthening the local bird festivals organized by the organization since 2017 in Bahía de Todos Santos, and since 2016 in San Quintín Bay. The exchange of experiences program is possible thanks to the support of the Commission for Environmental Cooperation (CEC), the purpose of this program is to visit shorebird sites along the Pacific Flyway, where conservation activities are carried out. Point Reyes National Seashore is a protected area that offers ideal sites for bird watching and wildlife. In fact, the area was named the number 1 birdwatching spot in 2017, where more than 54% of all bird species in North America have been registered. Throughout the three-day festival, attendees chose between more than 50 educational excursions and face-to-face events that took place in Marin and Sonoma counties, just north of San Francisco; these activities focus on birds, wildlife, plants and marine life, hiking, biking, kayaking, art and field photography where some of the award-winning naturalists and birders from the bay area participated as guides. The festival is open to all ages and experience levels. In addition, the festival offer activities on Friday and Saturday afternoons with keynote speakers where adults can meet and greet, enjoy local food and attend presentations from the best biologists and naturalists. Claudia and Antonieta participated in three classes: the first one was a birdwatching tour for experts led by Dan Singer, a specialist guide who has worked as an editor in the North American Birds magazine and in the eBird application. The second class was a beginner birding tour led by Rich Cimino and Janet Bodle on the Woodpecker trail of the Point Reyes National Seashore. The last class was a tour with the botanist Susan Cochrane-Levitsky to know and identify local endemic plants. The result of this exchange will be applied in the next local bird festivals in order to encourage participation and improve the experience of the attendees. PROTECTING AND SUSTAINING THE UNIQUE LANDS, WATERS, AND BIODIVERSITY OF WEST MARIN SINCE 1971 THROUGH ADVOCACY, ENGAGEMENT & EDUCATION. Join our circle of members or renew your support to help support our nonprofit mission throughout the year. Member benefits start at $35 for individuals, or $50+ per a household of two, but gifts in any amount are greatly appreciated. EAC is a 501(c)3 non-profit, and membership contributions are 100% tax-deductible unless noted. Members receive exclusive early-bird registration one week ahead of the public, which gives you a head start on all your favorite classes. Benefits also include special invites to our Member Meeting & Potluck, Piper on the Ridge, Litter Bugs Me and our Winter Gathering + subscription to our printed and online newsletters.